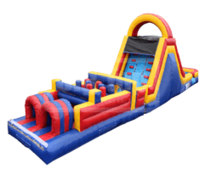 Check out our Obstacle Course with Double Lane Slide (Wet or Dry), a massive interactive inflatable that challenges partygoers to run, jump, and slide across the length of the obstacle course! Featuring classic colors of red, blue, and yellow, the Obstacle Course with Double Lane Slide includes a water slide that can be used either wet or dry, making it perfect for any time of the year. Great for parties, corporate events, backyard celebrations, and festivals, our Obstacle Course with Double Lane Slide is sure to make a big splash during your next upcoming event!